The Natik woman, "Emily," who taught Dr. Furness this figure had no name for it. I call it the "Triangles" until the proper name can be discovered. First, Second and Third: The same as First, Second and Third movements of "Ten Men." Fourth: Bend each thumb away from you over the lower near index string, pick up from below on the back of the thumb the two far index strings (Fig. 352), and return the thumb to its position. This movement draws the far index strings toward you between the upper and lower near index strings. Fifth: Bend each middle finger down over the upper near index string, pick up from below on the back of the middle finger the lower near index string (Fig. 353), and return the middle finger to its position. Bend each ring and little finger away from you over the little finger loop, and then down on the palm. 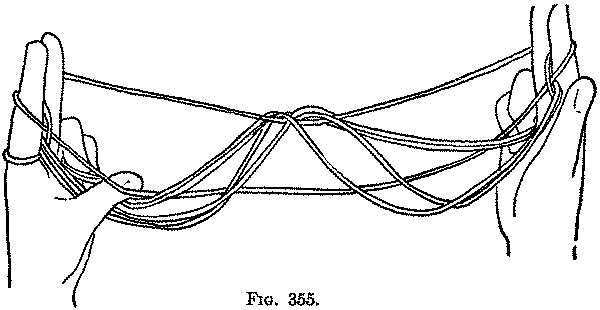 Sixth: Take each thumb out of its loops, and let the loops hang down (Fig. 354). Then pass each thumb away from you through these hanging loops, pick up from below on the back of the thumb the near index string (Fig. 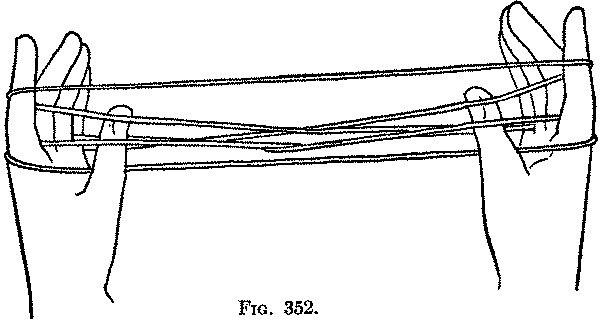 355, Left hand), which hangs somewhat loosely over the little finger loop, and return the thumb to its position (Fig. 556). Seventh: Turn the hands with the palms away from you, and holding the thumbs upright bend the middle fingers over the far middle iinger string and down on the palm. Then turn the hands so that the fingers closed on the palms face each other and the finished figure will be formed (Fig. 357). The only interesting thing about this figure is the method by which the final pattern is exhibited; in no other figure is the pattern turned over so that the far side becomes the near side.